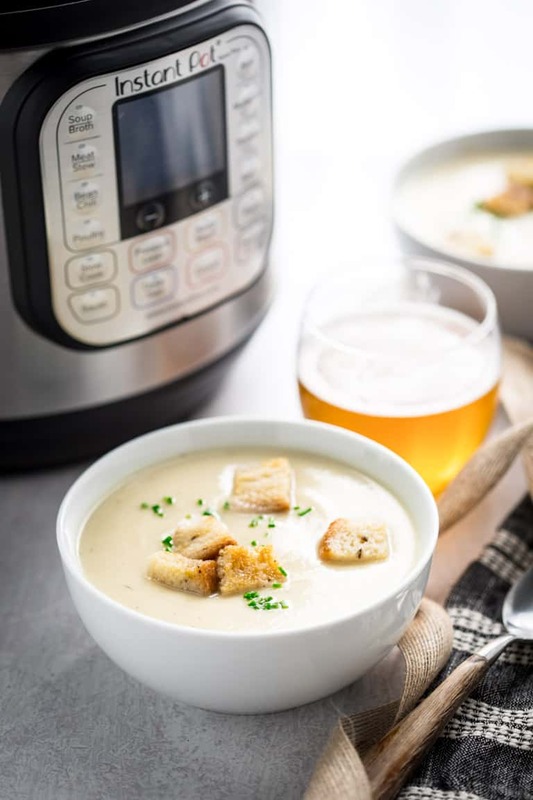 Today’s new recipe for Easy Instant Pot Cream of Cauliflower Soup with Sharp White Cheddar Cheese is the first of my new pressure cooker recipes here on Healthy Seasonal Recipes. But if you haven’t bought an instant pot yet, there’s a slow cooker option as well. The recipe is naturally gluten-free and only 245 calories per cup! On a recent trip to Costco, I wasn’t planning to buy an Instant Pot, but it ended up in my cart. Just like that. Well, actually the story is a bit longer. Backing up, and as a disclaimer, I actually hate shopping at Costco and I force myself to go two or three times a year for specific items only- avocado oil, paper towels, Spindrifts, Kind bars, my wreaths at Christmas time etc. So I tend to go in with blinders on and pretty much only buy whats on my list. In and out, no harm, no foul. On this recent trip I had planned to stop there first then head to Home Depot and Bed Bath and Beyond for the other items that I needed to buy for my studio- stuff I hadn’t bought yet, like silverware and a microwave. But then I got to Costco, and whatdayaknow… right there in isle two is a microwave and silverware! So into the cart they went. And then my eyes fell on the Instant Pot. And I really had been thinking about buying one, but just hadn’t pulled the trigger. I guess I was thinking that I wasn’t sure if you all would be into the idea. I was thinking “Did we all really need to buy another kitchen appliance?” Truth be told, it was one of those “breaking the seal” moments since there were already those two other items in my cart. So into the cart it went. Just like that! It only took me a couple days to fall completely head over heals with this magical invention my friends, and I am telling you if you are in the camp I was “do I really need another kitchen appliance?” the answer is unequivocally YES! Not only is it great because it is hands off cooking, so you can be folding laundry while your dinner is cooking. But it also sautés and you can also use it as a slow cooker too. It came in a box with a cooking guide to give general guidelines for how long to cook various foods. And that’s given me a lot of confidence in trying it out. That doesn’t mean I have been always pumped for the end results. So far I have made a lot of mushy foods fast. Lol. But don’t worry, I am not going to share any of the fails. Only the wins! This Cream of Cauliflower Soup is my first success and I am so stoked to share it with you all! Whisk the liquid and spice in the insert of the instant pot. I used mustard because it really needed a kick of flavor, and the taste of the mustard paired well with the cauliflower and cheese. 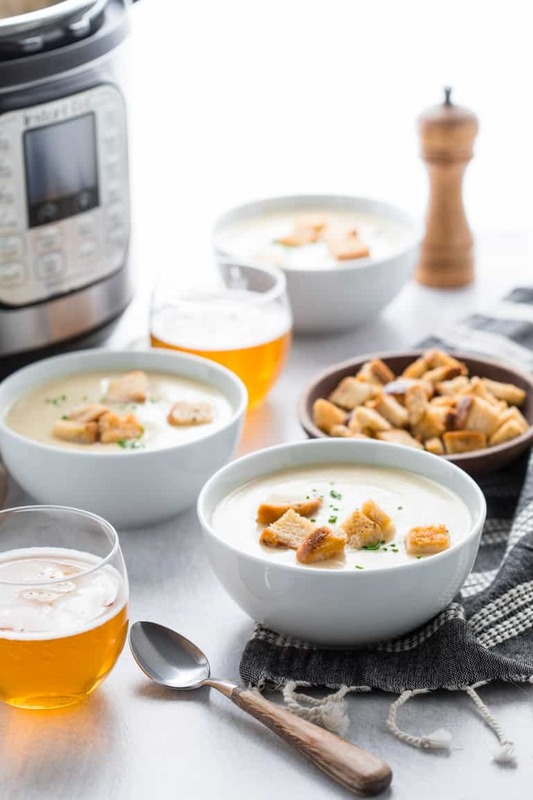 Note: if you are gluten-free or making this soup for someone who is gluten-free, use dry sherry instead of beer, or choose a gluten-free beer. Then seal the lid close by twisting it. If it is plugged in, it should make a clever bleeping noise to let you know you’ve secured the lid correctly. Next- a super important detail- turn the valve on the top to “seal” position. That closes up the chamber so that the pressure can build up inside the pot. Then turn it on to high for 10 minutes. Note: it takes a while for the pot to come up to pressure. Like 12 or 15 minutes. Then the timer will start. This is normal. Once the timer goes off (and the Instant Pot beeps like there is a major emergency) you can release the pressure, but MAKE SURE YOU DO SO SAFELY! Here’s how: Put an oven mitt on your hand. Put a set of tongs in the oven mit. Use the tongs to twist the valve to release to “quick release” the steam. It will splutter a bit, so the oven mitt will protect you from any spray or steam. The steam show is crazy people. It’s so exciting! Ha ha! Your house will suddenly smell like delicious soup. When the steam stops, you can remove the lid. It will bleep again. And there will be your cooked veggies and broth inside- looking totally different from before you closed the lid. Next puree the soup. I like to do that right on the spot with my immersion blender. But if you don’t have one, do it carefully in batches in the blender. Take care when blending hot liquids!!! Don’t overfill and make sure the lid is on tight, and cover it with a dish towel and hold it down so it can’t pop off. Once the soup is pureed, it is safe to add in the shredded sharp cheddar cheese and half and half. I made rye bread croutons to go on top of this by cubing rye bread (I like the kind with caraway seeds.) Then I tossed them with avocado oil, salt and pepper and baked them at 350 until they were crispy- about 12 minutes. I stored them at room temp for a few days in a Ziplock bag. I also topped the soup with chives for a little bit of color. Scallions or red onion would also be a nice option. You could also garnish with a little extra cheddar cheese if you like. And bacon would be obscenely good!! If you are serving this as a main course, then a serving is 2 cups. If it is a side or starter, then one cup should do it. If you are serving as a side dish, this recipe pairs well with my chopped winter salad or my Caesar Salad with home-made egg free dressing. What have you made in an Instant Pot that you really liked? Remember if you make this recipe please come back and give it a star rating and review! It is really helpful! Also make sure you check out my Produce Spotlight: the Ultimate Guide to Cauliflower too to read more about this amazing veggie! 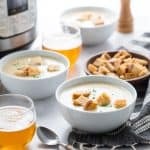 Instant Pot Cream of Cauliflower Soup with Cheddar cheese with a slow cooker alternative. Naturally gluten-free. 1. Whisk broth, beer, mustard, thyme, salt and pepper in the insert of an instant pot or a large slow cooker. Add in potatoes, celery, garlic, onion, parsnip, and cauliflower. 2. For instant pot close lid and set float valve to seal. Set to high for 10 minutes. If using slow cooker set to low for 8 hours. 4. Puree soup with an immersion blender (or very carefully in batches in a blender) to desired smoothness. Stir cheese and half and half into hot pureed soup. Serve hot! 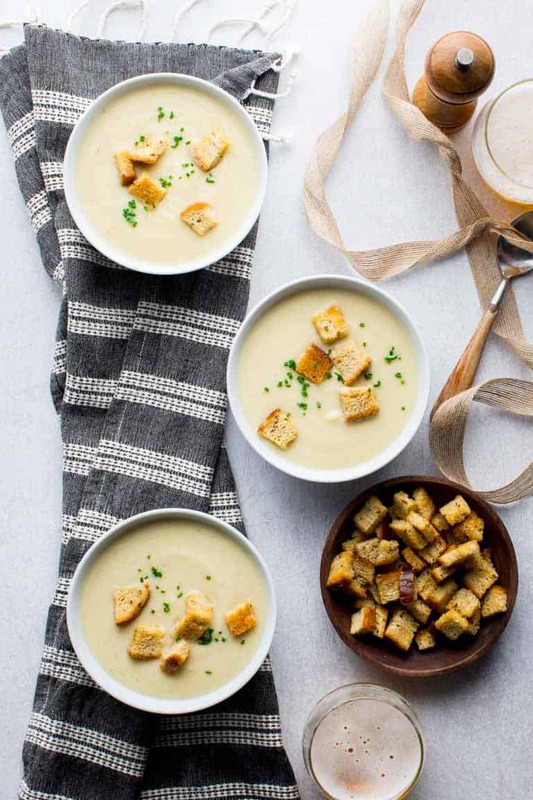 This instant pot cream of cauliflower soup looks absolutely delicious! I love a nice cozy soup in the fall and this soup is calling my name! I love it in the fall too. Especially for lunch! We don’t even have Sam’s here to compare them. I am sure I wouldn’t like that either though. Ha ha. 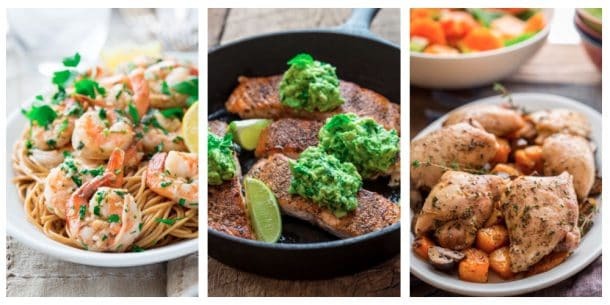 What a great use of the instant pot! 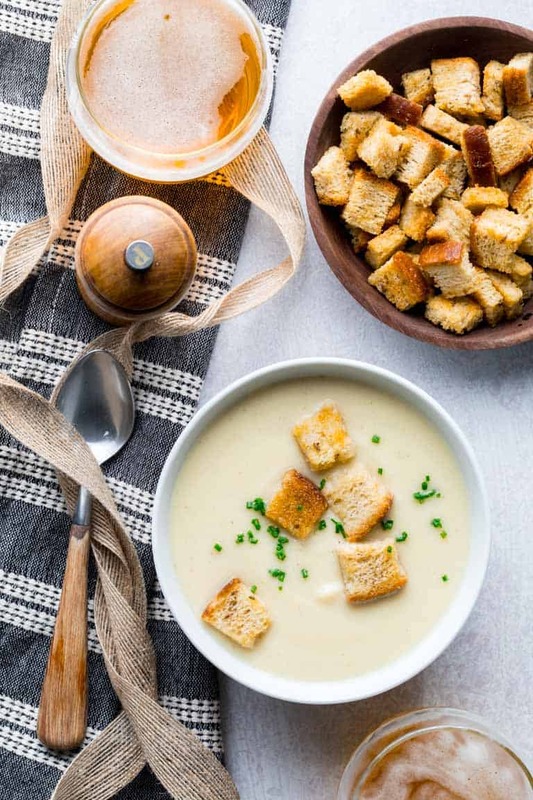 Cauliflower soup is my favorite and your recipe looks creamy and perfect! I really want an instant pot! This soup recipe is going on my to make list, in hopes I get one soon!! I love the idea of a healthy meal on the table so fast! Try it in your slow cooker if you have one. It is just as yummy. Time to dust off the IP and get this cooking. I say so for sure! It’s a great way to get your veggies! Two Sleevers Cream of Mushroom Soup!! Oh a creamy mushroom soup would be good. I will have to try that too! I was a total Instant Pot skeptic until I tried it! Now I don’t know what I’d do without mine. This soup looks so incredibly creamy and perfect for a chilly day! Me too! I am having more wins than losses at this point too, so I feel like the learning curve is pretty easy. Cauliflower soup is a staple at my house and your version with the white cheddar sounds awesome! I’ve been on the fence about buying an Instant Pot as well. I love my pressure cooker and slow cooker and use them all the time. The ability to saute in the Instant Pot is convenient though. I usually dirty up another pan when using the slow cooker. Oh, you know I actually didn’t know how to distinguish between an instant pot and a pressure cooker. Now I know! Thanks Kelly! So. Dang. Good. This is amazingly easy, delicious comfort food at its max! So quick in the IP too! I had no beer (imagine that?!) but I had dry why wine so I used that. Lightened it up just a *tad* by using some half and half with unsweetened cashew milk. Couldn’t lighten up on the cheese…had to use Cabot sharp cheddar:) ~ this is a keeper! 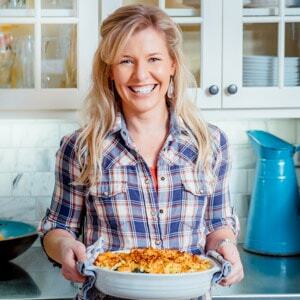 Thanks so much for sharing your yummy, healthy, seasonal recipes! Tammy thank you so much for coming back to leave this review. It just made my day. Finally cracked open my Instant Pot I received for Christmas. This was my first recipe in it and the soup is delicious. Thank you. Can this soup be frozen? Hi Danielle, That’s so great. Now the fun begins for you! Yes you can freeze it. One note, be careful if you are reheating it on the stove so the cheese doesn’t scorch on the bottom of the pot. I find it’s easier to reheat in the microwave. Looks good – I presume it would freeze ok . . ? I couldn’t eat it all in one go . . . or maybe I could! !